MSF teams are working in multiple areas in Jordan, Lebanon and Iraq to provide Syrian refugees with medical care and humanitarian assistance. Into its fourth year, the war in Syria has killed more than 150,000 people. More than 6.5 million are displaced inside its borders, and more than 2.8 million have fled the country. Like a disease that spreads far beyond the initial point of infection, the reach of Syria's war is visible in many places at once. 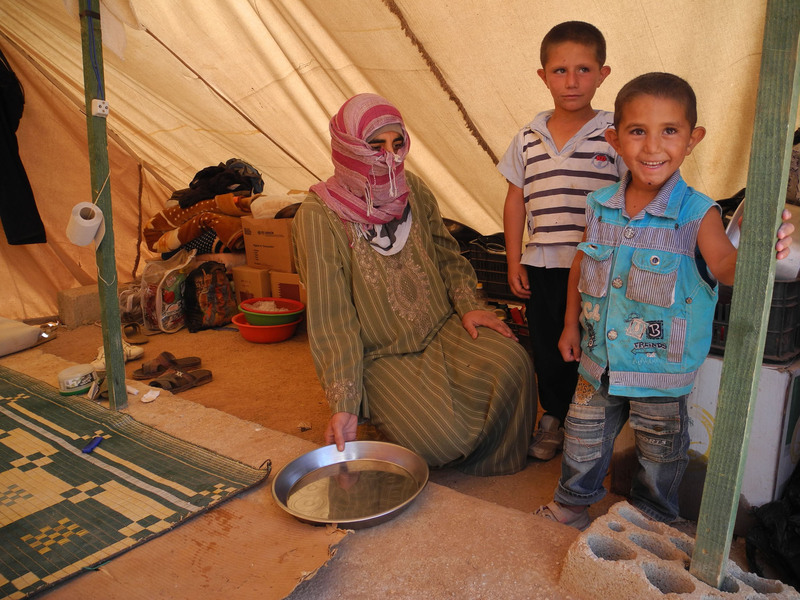 MSF humanitarian workers of different backgrounds experience "a day in the life" of this brutal, relentless conflict in Jordan, Lebanon and Iraq. As the day begins, surgeons in two different places in Jordan have started their work. Dr. Haydar Alwash, a surgeon originally from Iraq, works in Ramtha Hospital in northeastern Jordan. He starts his rounds around 8:30 this morning, dealing with the consequences of bombs or gunshot. 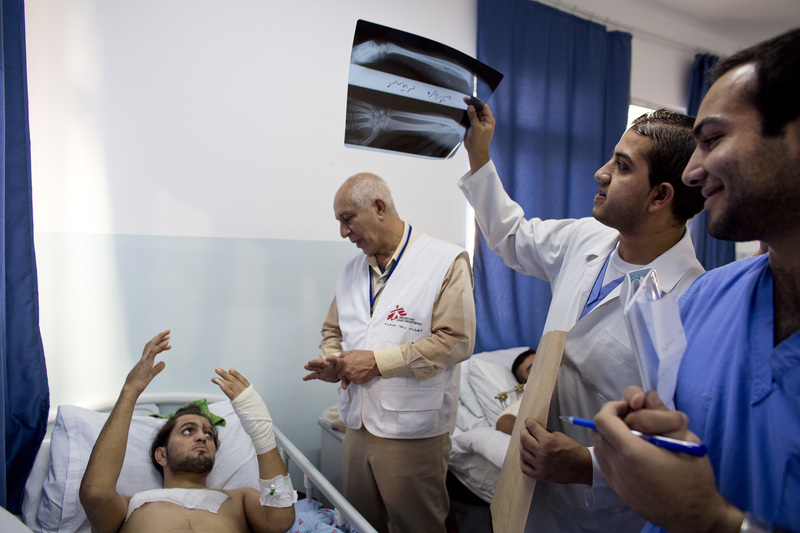 "All our patients are newly injured in this conflict," he says. "Our work mainly concentrates first on surgical procedures that can save lives or save limbs." Dr. Alwash reaches the bedside of a girl named Rukaya, 14, who was hit by a shell. She did not realise that she had lost both legs and her mother was dead until she woke up in the hospital. Seven operations followed, and another tomorrow to prepare her for the prosthetics. Rukaya smiles when she talks to Dr. Alwash, asserting her determination to be happy again one day. Her smile helps the doctor to cope with seeing the maimed arrive one after another. At the same time in Amman, Dr. Ashraf Bustanji, an MSF maxillofacial specialist, is stepping into the operating theater to perform surgery on a Syrian man who has suffered extensive facial injuries. "Most of the cases here undergo multiple reconstructive surgeries," he says. "Most of the time the treatment cannot be completed in a single stage, or within a couple of weeks, or one month." It's not just the surgery. There is also the physiotherapy and rehabilitation. They have to re-learn how to use damaged limbs or the prosthetics. Patience, perseverance, and pain management are crucial, because the road back to health from injuries like these is guaranteed to be a long one. “The cases here are challenging, but along with the medical treatment, the project is giving hope to these patients, by trying to alleviate their pain, their suffering.” says Dr. Bustanji. On the same morning, people are already assembled outside four different MSF clinics in Lebanon's Bekaa Valley. 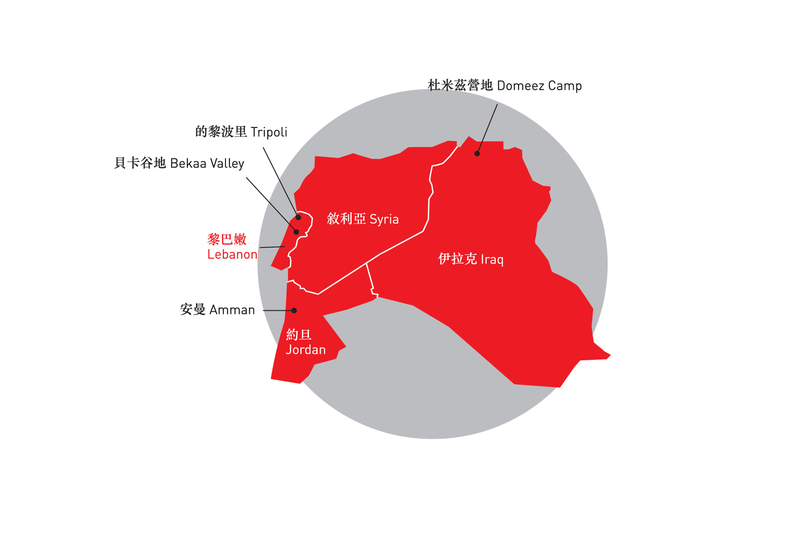 These projects in clinics are only one facet of MSF's work in the area. As there are no organised camps for refugees, Syrians fleeing to Lebanon have to find their own shelter, for example in empty schoolhouses or an abandoned prison. 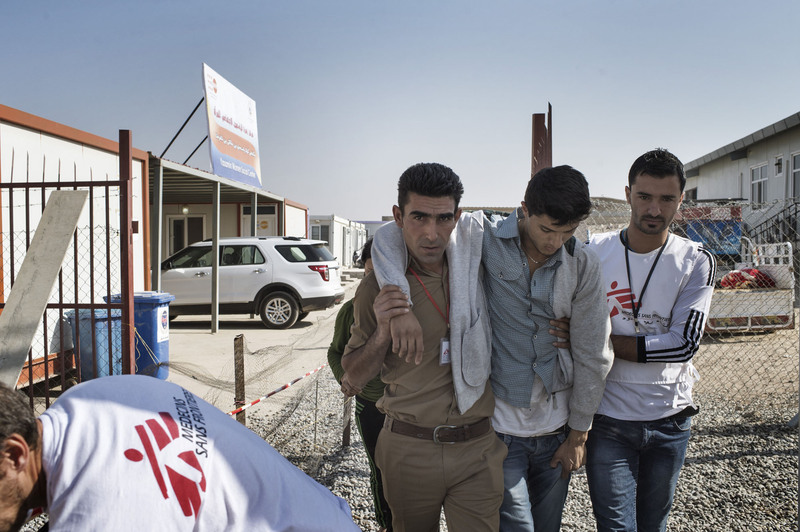 Local medical services are limited, particularly for refugees not registered with the UN. To make matters worse, the area occasionally gets hit by shellfire. Too often, people do not know where they can access medical attention so it is not enough to wait for people to come to the clinics. Hanane Lahjiri, an MSF community health worker, has to seek them out, driving from one refugee settlement to the next. The first stop on this day is the Abu Ismael settlement, where Lahjiri wants to check in on a woman whose baby died shortly after being born. The roads in the Bekaa wind through valleys and hills, but wherever MSF staff travel, they find people seeking assistance. It is also a busy morning for Dr. Mustapha Khalil, a specialist in emergency medicine in the Domeez refugee camp in northern Iraq. Soon after entering the ward he sees two boys, one with ear and respiratory infections, another scalded by boiling water when a pot toppled over. There are also a baby with urinary tract infection and a girl who needs stitches for a large cut on her finger. "Every morning is like this," he says. MSF's mental health teams in Domeez also conduct seven to nine sessions per day. They hear of depression and anxiety from adults, and nightmares, problems sleeping, and bedwetting among children. "People have suffered a lot in Syria. A lot of families were torn apart.” says Henrike Zellman, an MSF psychologist who worked in the camp. Many people were injured, lost loved ones or their homes. They don't know how long they will be in exile or if there will be anything to return to should the war ever end. By nightfall, hundreds of patients were seen and treated in MSF's projects. Several surgeries were performed as well, while people still have to be in the face of ongoing violence. MSF will continue doing what it can in the hope that at some point in the future, a day in the life of the people affected by the war in Syria will look very different.